Vicente Mota Alfaro became the first converts in Spain who holds the position of imam at the mosque the Islamic Cultural Center of Valencia (CCIV) and lead the congregational prayers at the mosque. In addition to the mosque imam, Alfaro is also a member of the Board Direkur CCIV since 2005. 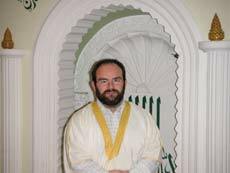 The position of Imam of the mosque may have never imagined before by Alfaro, because thirteen years ago he was a devout Catholic, diligently reading the Bible every day and never missed attending weekly Mass at his church. When asked about his change of heart and his journey from a devout Catholic who became a Muslim, Alfaro gave a simple answer, "It is all the will of Allah, Islam became my choice and become my life." Alfaro decided to Islam when he was 20 years old and still a high school student. "I read the holy book the Koran. I found the truth about the story of Jesus Christ and then I converted to Islam," Alfaro told his journey to find the light of Islam. Basically, Alfaro was known religious. Since childhood, Alfaro has been diligent to church every week and read the Bible regularly. "I did it, while the other children at that time had no interest in religion. At that time, I certainly do not know about Islam," he said. Alfaro know Islam from its neighbor, a Muslim from Algeria that he often invited talk. "One time we were chatting and he told me that all human beings are descendants of Adam and Eve and we are all children of Abraham," recalled Alfaro about the neighbors. "At that time, I was stunned to hear of Muslims and Arabs know about Adam, Eve and Abraham," continued Alfaro. The conversation was motivated Alfaro to explore more about Islam. He became a frequent visitor to the library and borrow a translation of the Koran. Translation of the Koran that he read thoroughly at home. "I have often read in the Gospel that Jesus is the son of God and God sent his son to earth to be killed and tortured in order to liberate mankind's sins. I always have a problem with it, especially to be able to trust the story," Alfaro said. And the answer he was looking, found in the Koran. "I learned from the Koran that Jesus was not killed or crucified," said Alfaro. The story of Jesus in the holy book the Koran Alfaro heartfelt thank two sentences which since changed its name to Mansour's creed. "I immediately believed that the Koran is the true holy book from God. And I immediately decided to become a Muslim," said Alfaro. That trip Alfaro or Mansour find the truth in Islam. Until the leaders of Muslim communities in the city of Valencia agreed to choose the imams of Valencia. Alfaro was chosen because it is considered to have the capabilities and fulfill the requirements to become imams. "He was chosen because of her extensive knowledge about religion," said El-Taher Edda, secretary general of the Islamic League for Dialogue and Coexistence. Edda also confirmed that the appointment of imams Valencia Alfaro as a clear message about the integration of new Muslims into Muslim society. The number of converts in Spain continues to increase in recent years. According to local media reports, Spanish citizen who converted to Islam even among intellectuals, academics and anti-globalization activists. Currently, the number of Muslims in Spain An estimated about 1.5 million of 40 million total population of the country. In Spain, under the law of religious freedom in 1967, is recognized as the official religion of Islam and became the second largest religion after Christianity.